If you want to modify template content only for the current design, you can detach the design from the template. Detaching copies the template content into the design allowing you to make changes, and breaks the connection. Therefore, changes you make to the original template will no longer affect the design. Click the Sidebar button in the Editor toolbar, or use the keyboard shortcut. The template information is located in the Settings tab. 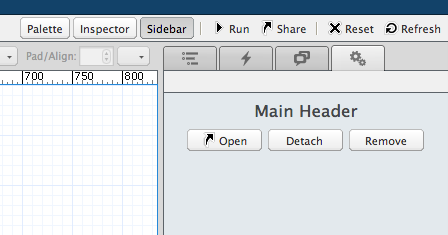 Click the Detach button in the template section. The template content is copied into the design allowing you to make changes. As shown below, click the Detach button in the Settings tab to detach the design from the template.